From dresses to venues and the ever-political guest list, there are a hundred and one decisions to be made between now and your big day, so trust us when we say that it’s completely normal to feel a little overwhelmed. 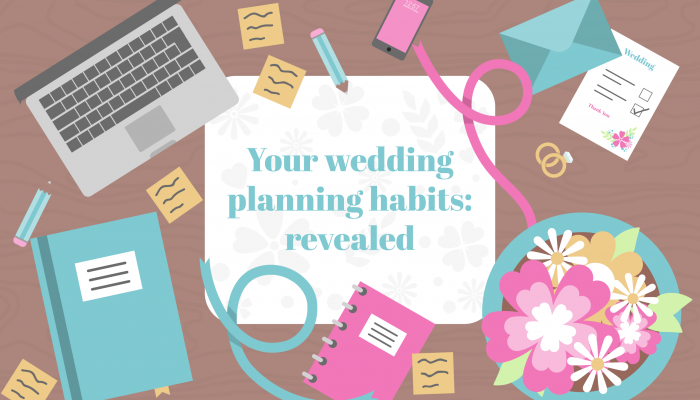 We spoke to over 150 couples to find out just how they tackling this momentous task, and give you a little more help in planning the wedding day of your dreams. 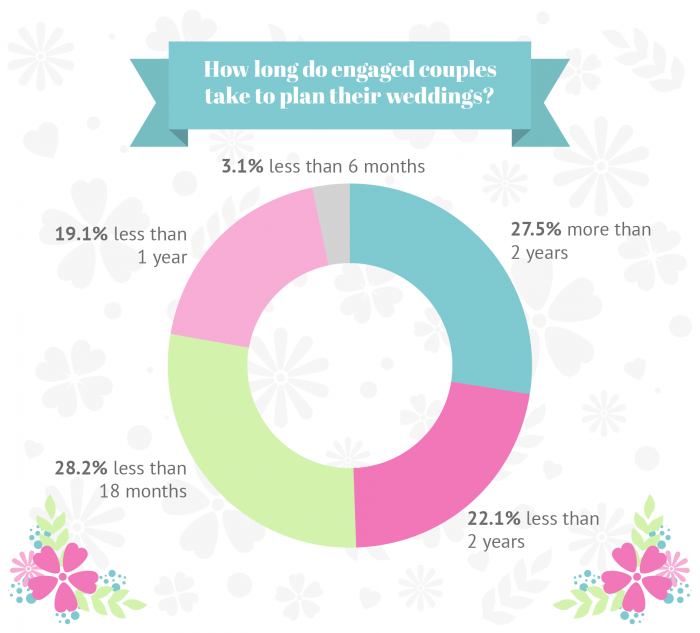 Most wedding planning calendars start roughly eighteenth months to two years in advance, and the majority of the couples surveyed matched these. 50% of couples took between 1 and 2 years, of which 28% took between 1 year and eighteenth months. Plenty of couples step outside these time slots. In fact, 27% took over two years to make sure their wedding is perfect, and 19% decided on 1 year. Only 3% of brides and grooms planned their day with less than 6 months to go. While it is completely up to you how much time you take planning your big day, we would suggest sticking to the norm here. Wedding dresses, for example, can take up to 9 months to come into store, and many wedding bands and photographers book up a year in advance. Starting your planning can be particularly stressful if you’re not sure about what you want. Often, this first decision will inform many other aspects of your big day, such as the dress style or the venue location. Even the flowers you pick can influence the rest of the colour scheme, so tread carefully. You should plan what you consider the most important aspect of the wedding first. 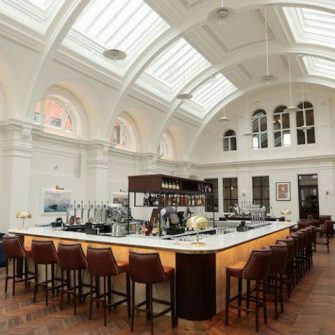 Most of our respondents (86%) believed this to be the venue – and it makes sense. 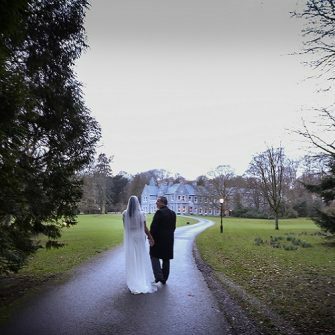 With the venue locked down, you’ll be able to decide on travel arrangements, what kind of dress style is possible (ballgowns and rural settings aren’t so great a match, for example) and be 100% certain about the date being printed on your stationery. There is no ‘right’ way to plan a wedding, of course, and some people fall outside the norm. 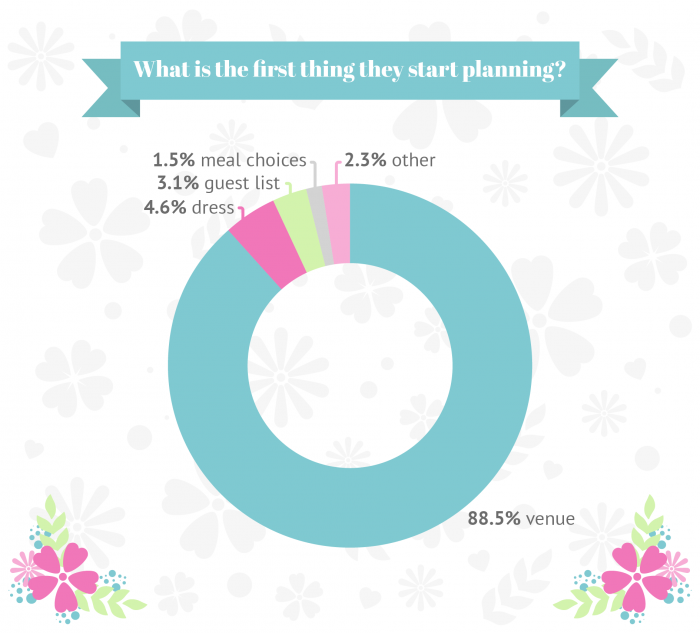 For example, 5% of respondents started their planning with the dress, which works if that is what you care about most or know exactly what you want, and 3% kicked off their planning by confirming the guest list. This is another sensible choice, as the number of guests you have may limit your venue choices. Some larger venues, for example, may expect a minimum of 200 guests, and other smaller places may cap the numbers at as little as 40 or 60. As for finishing touches, most couples opted to leave the honeymoon planning until the end. The best time to book your honeymoon is actually six to eight months, so if you are wanting to spend a couple of weeks away with your new husband or wife, it’s a good idea not to leave this too late. Rather, you might think of this organisation as “time off” from the planning of the big day – after all, this is a holiday all about you two, doing whatever you want to do! Or at the very least, you might book your flights and accommodation in an evening and leave the finer details until later. 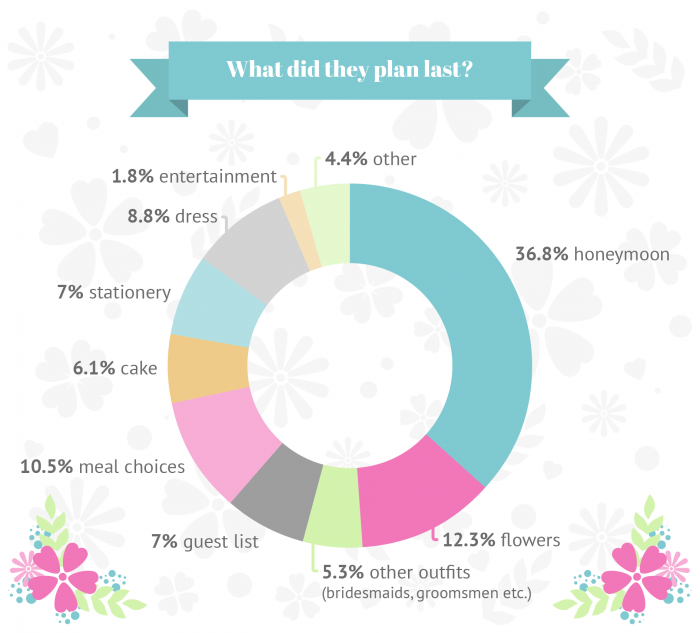 Others decided to push back the flowers (12.3%) and 10.5% finished off their planning with meal choices. When asked who had the most influence over their wedding planning decisions, most couples pointed to each other (42%). The next most influential person in our surveyees lives was, of course, their mothers. The mother is a notorious figure of the wedding scene, comically depicted as always knowing best and not-so-gently letting you know it. Of course, in reality, the reason many brides and grooms turn to their parent is that they have gone through all of it before, while siblings and friends may not have. She knows what works and what doesn’t from her own big day, and won’t hesitate to share it with you. Not only that, but she’s your mum – she wants what is best for you and will be prepared to deliver you the hard truths you don’t want to hear. Your friends may not want to tell you that dress looks awful, but mothers don’t mince their words. 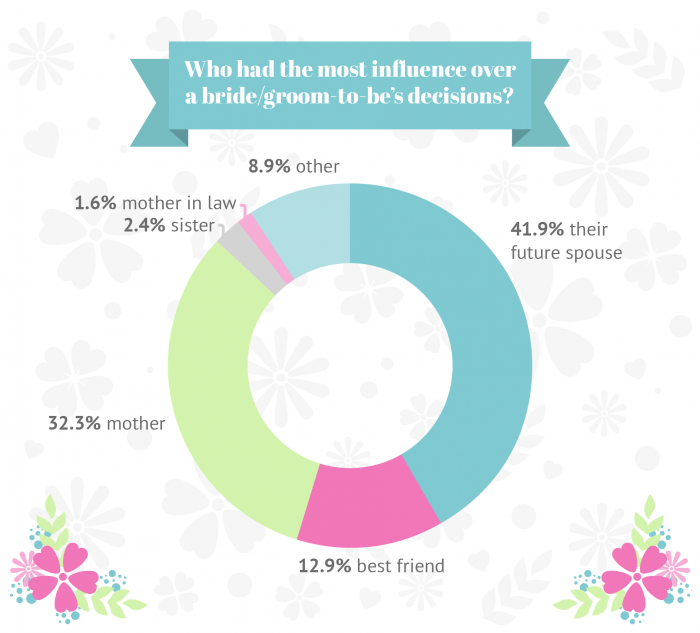 The third most influential person during the wedding planning was the best friend (12%). This is the person in your life who probably knows you best, from your tastes to what really suits you. They’ll go above and beyond to make your day perfect, and be there to calm you down and make you laugh when things get a bit much. Don’t believe those dreamy Insta shots – wedding planning eventually takes its toll on everyone. Whether its a year in advance or a last-minute meltdown, remember that absolutely every bride and groom feels the strain of managing an event for a hundred people or more, with the expectation that it must be absolutely perfect. Take your time, make it fun and remember that all the planning in the world cannot account for discrepancies on the day, and you’ll just have to roll with it. The best thing you can do, therefore, is enjoy the planning process – the prosecco and dancing in the bridal boutique, and late nights laughing and swapping colour scheme ideas with your SO – and enjoy your day even more.